Weight training sets and reps are what make up a good weight training plan. Here's what they are, and how many you should do. 'Rep' is short for 'repetition.' A repetition is one instance of an exercise. So if someone were doing squats, one down-and-up squat is one squat repetition. 3 Sets of 8 reps at 130 pounds. There are normally 3-5 sets done at each exercise before going on to the next one. What's The 'Right' Number of Sets and Reps? First off, there is no 'right' number of sets or reps. It depends on what your goals are. You do know your goals, right? Here are the number of reps per set that are best for your three possible goals when weight training. 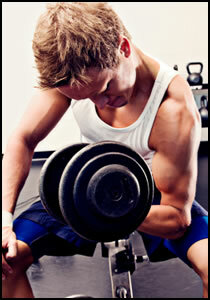 So if you want to keep your focus on increasing your strength, lift for fewer reps, around 5. If you want to focus on bodybuilding and getting big muscles, do between 8 and 12 reps.
And if you want to make it an endurance exercise, make it 15 reps or more. Running and biking are both endurance exercises, since they have lots of reps (steps and peddles, respectively) - way more than just 15. To mix it up a bit you can try super sets for a different approach to sets. It's a great way to fatigue your muscles and get them really sore. • Click here to leave 'The Definition of Weight Training Sets and Reps' & go back to the Home-page!